Kaffe Fassett told me I had mad color skills, ah, I am still smiling today about that. I took a color/quilt workshop from the world famous Kaffe Fasset and Brandon Mably on Thursday. It was a ton of fun. The first quilt book I ever bought was Glorious Patchwork by Kaffe Fassett and it was when I was in college. When I heard that my local quilt shop, Dragonfly Quilts was hosting a workshop, I jumped at the chance to join the fun. We were working on a quilt layout from his book called "Diagonal Madness" It's a bunch of 4 inch and two inch squares that are laid out in diagonals to create fun patchworky color. It's harder than it looks to get all those fabrics to work together. So if you're thinking by now, "Jennifer this blog is supposed to be about beads..." well here you go. The first thing out of Kaffe's mouth at the workshop was this. 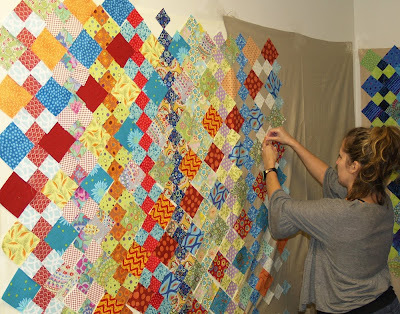 He is a painter, a needle worker, a knitter, a designer, and a quilter. They are all ways of getting his passion out. It's color. That's what most artists are about is the color. We all choose one or two or more mediums to convey those colors we have in our head. That hit home for me, because that's exactly how I feel too. So even though I was laying out quilt blocks on Thursday, it could have just as easily been a piece of jewelry or a painting. Here's Kaffe talking about some of the other layout's in class. Here's is Brandon talking about the class too. Look there's my quilt layout behind them. I love this quilt with all the pinks, blues, and greens. I think this was my favorite layout in the class. I am in love with her colors. Check out the cookies! Jessica Brynn Howard at Numero Uno made these. Don't they look just like Brandon's shirt? They were really yummy too. Now comes the not as much fun part of the process, I have to sew all of those squares together. I will show you when I have some of it assembled.